Do you want to read all Yahoo email messages from another email account? We’ll tell you how to do this. Managing multiple email accounts is a difficult task. We should sign in to each account regularly to check and respond to the messages. As we know, it is not practical always. Smartphone users can use email apps to access all email accounts from a single interface. But email management on computers is entirely different and we should find alternative solutions for that. Yahoo email users can forward all emails they receive to Gmail, Outlook or any other email service. Thus you can save time in handling emails. 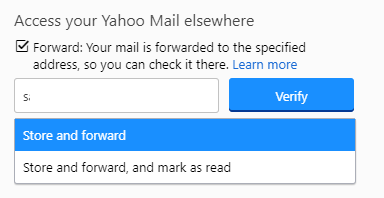 The forwarded messages are still accessible in your Yahoo inbox and so you can sign in to the account anytime to check them. 1. Sign into your Yahoo email first. If you are using new Yahoo mail interface, shift to classic mode temporarily. The feature we’re going to explain is available in classic version only. Click Settings from the top-right side of your Yahoo mail screen. Scroll down to the bottom and choose ‘Switch to classic Mail’ option. The classic mail users can go to the next step directly. 2. Mouse over Gear icon from the top-right corner of your page and choose ‘Settings’ from the menu. 3. A box will open. Click ‘Accounts’ from the left pane. Under Email addresses, Select your email account from which you want to forward the messages. 4. Scroll down to locate ‘Access your Yahoo Mail elsewhere’ section. Specify the email address to which you want the emails to be forwarded. Choose ‘Store and forward’ or ‘Store and forward, and mark as read’ option from the drop-down box. Both are same, but the second option will mark as your email is read in Yahoo inbox. Click ‘Verify’ button to send a verification link to your new email address. Save the changes you made. 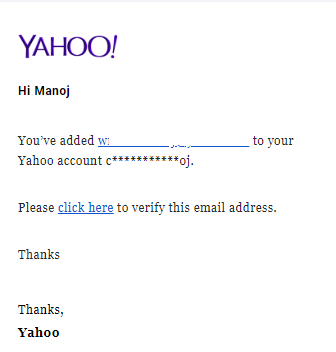 Sign in to the account and open the email you just received from Yahoo. Click the link to verify and receive all your future Yahoo emails in the new destination.